The revenue of ads is used in charity. 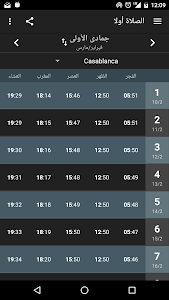 Salaat First calculates local prayer times accurately using multiple conventions. • Notification for each prayer with the ability to choose the sound from multiple adhans. • Reminder before adhan with the ability to choose the duration for each prayer. 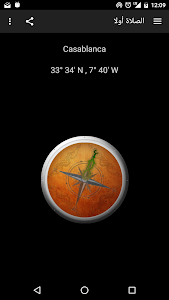 • Finding the location using GPS, or manually by searching in a database with more than 40000 city, or using internet. 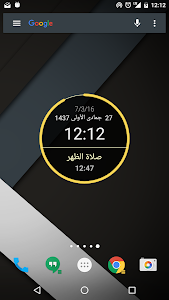 • Updating location in background to get accurate prayer times without the need to change configuration. • A Compass to show the Qibla direction. • View monthly prayer times. • Ability to adjust prayer times manually. • Multilingual: Arabic, English and french. برنامج الصلاة أولا يتيح حساب مواقيت الصلاة المحلية بشكل دقيق إن شاء الله، بالاعتماد على طرق حساب متعددة. • تحديد الموقع عن طريق الجي بي إس، أو يدوياً عن طريق البحث في قائمة بأكثر من 40000 مدينة، أو عن طريق الإنترنت. • تحديث الموقع تلقائيا في الخلفية، للحصول على مواقيت مضبوطة بدون الحاجة لتحديثه يدويا. • أحاديث نبوية مأخوذة من صحيح البخاري. • بوصلة لتحديد اتجاه القبلة. • إمكانية تعديل أوقات الصلوات يدوياً. 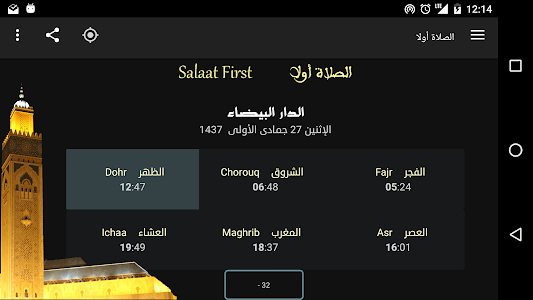 Similar to "Salaat First (Prayer Times)"